The officials of the NHAI (National Highway authorities of India) today met the members of the Belgaum chamber of commerce and industries and assured them that the maintainence work of the road from third gate to Zad Shahpur would be taken up in a couple of days. The officials also categorically denied that the authority had received any proposal for road widening from Fish Market to Zad Shahpur. The road in question has many pot holes and due to which many accidents have occurred and hence the Chamber on the complaints of the members had given a ultimatum to the NHAI. Road widening from 3rd gate at least is must if no proposal has come than why are being tress cut down ??? If any NHAI official visiting this blog, i would like to point out one more problem. 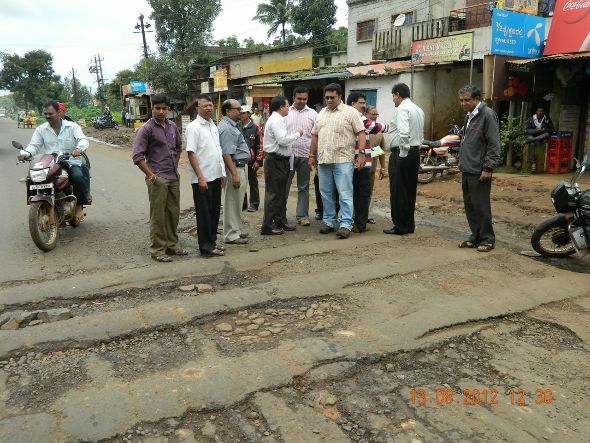 The Road from Majgaon cross to Piranwadi, both side of the tar-road is covered under a layer of Mud/Sand. This part of the road is the busiest during Morning & Evening time & have lot of pedestrian, cyclist & two-wheeler. Due of the accumulation of mud on the sides of tar-road, the breadth of the road has got narrower and causing lot of inconvenience to the motorist and pedestrian. It has reduce the breadth of the road by 3ft to 4ft. This problem is in addition to the problem mentioned above in this news article. It would be of great relief if the concerned authorities act upon and clear off the edges(sides) of the road along with the patching up the pot-holes & other maintenance works. Also Uday Sir please see if this issue can be forwarded to appropriate authority.